Located in Tangzha town, one of the places of origin of modern Chinese industry, the Second People’s Hospital of Nantong sits by the Tongyang River in Gangzha district. 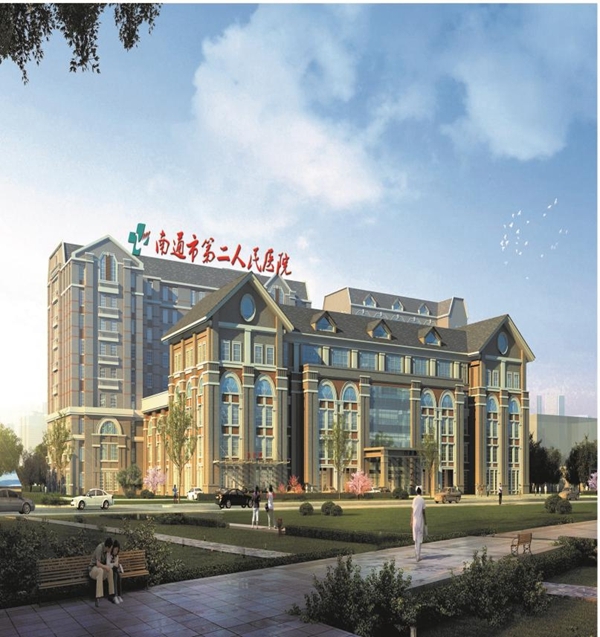 Founded in May, 1958 as Nantong Worker’s Hospital and Zhiming Hospital, it has developed into a large municipal comprehensive hospital, integrating medical treatment, health care, education, scientific research and disease prevention. The hospital is equipped with outstanding departments and 1,000 registered beds. It has 15 inpatient areas, 25 clinical specialties, eight medico-technical departments, one municipal key medical discipline, four municipal key clinical specialties and two municipal key clinical construction specialties. The department of orthopedics was among the first municipal clinical key specialties in Nantong. The department of rehabilitation medicine, a key medical discipline, is a key clinical construction specialty of Nantong, as are the departments of cardiovascular medicine and neurology, while the department of gastroenterology and the department of laboratories are municipal clinical key specialties.